An elderly man, quiet by nature who uses the voice little, complains of weak, gravelly voice quality. This view of phonation, standard light, shows a slightly wider dark line of phonatory blurring. Also, the false vocal cords are overly approximated, but not yet participating in vibration (for that, see images 4 and 5). Strobe light reveals an unusually wide amplitude of vibration, denoting flaccidity of the true vocal cords. Maximum closed phase shows the telltale residual opening at the anterior commissure (from this perspective, the lowermost end of the true cords), also a potent indicator of flaccidity. When asked to produce louder voice, the false cords begin to participate in vibration, and a rough, gravelly superimposed “godfather” quality arrives. Notice that the true cords are in at least partial open phase of vibration. Now the false cords are in open phase of vibration, and the true cords are in maximum closed phase of vibration, with the same residual opening anteriorly seen in photo 3. False cord phonation is not to be seen most accurately as primary here, but as a secondary result of effort necessitated by flaccid true cords. After right hemilaryngectomy for cancer, performed elsewhere, breathing position. Notice the left vocal cord (right of image) is partially intact (arrow), though with scarring at its anterior end (at “S”). 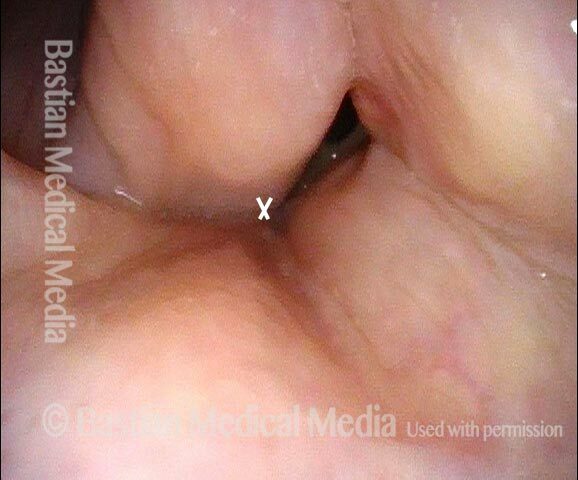 During supraglottic phonation using conventional view, true vocal cords cannot be seen. Under strobe illumination. With assistance of topical anesthesia, during high pitched phonation, is the only “true vocal cord voice” this patient can achieve. This is the “closed” phase of vibration, though of course the glottis is not truly closed as one can see from the persistence of the black glottal gap. Same view as photo 3, still under strobe illumination, now with left vocal cord slightly lateralized for the “open phase” of vibration. Note that the black glottal gap is slightly wider. This “glottic” or true vocal cord voice is extremely breathy and high-pitched, and will not serve the patient’s vocal needs. Strobe view during supraglottic phonation, using a much lower pitch and with a rough vocal quality. 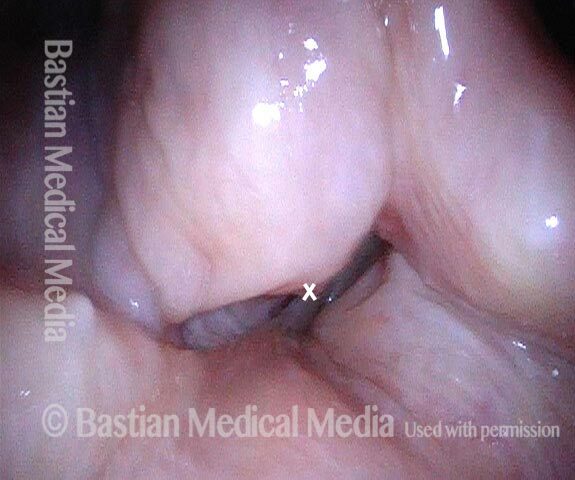 This is the “closed” phase of vibration with residual aryepiglottic and false cord tissue at "X" partially closing at the level of the intact left false vocal cord. Same view as Photo 5, but at open phase of vibration, with the marked "X" tissue at the “lateral swing” point of vibration.